This morning we took Ethan to Bedner's, a local farm and market, for their annual pumpkin patch. Experiencing all of Ethan's first holidays this year has been one of the things I've been most excited for, Halloween included. 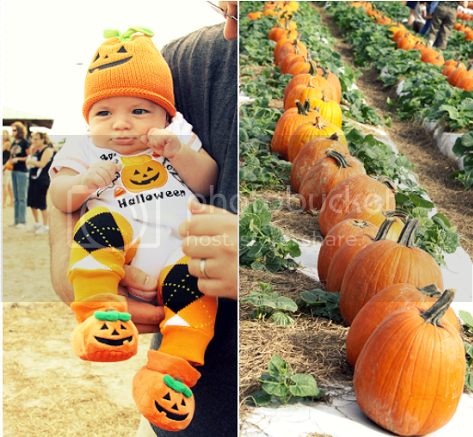 Bedner's was packed with babies and toddlers adorned in the cutest Halloween and fall themed outfits, posing by the hay bales and pumpkins. I took my teenage sister to Bedner's last year, eager to pretend in my mind she was still young enough to enjoy the pumpkin patch and posing for photographs along with the small children in their costumes. She had sweetly thanked me for taking her but asked if maybe we could head home, or out to lunch instead, and then noted that I should just have a baby so I would stop dragging her to such places. Not that she minded, she quickly interjected, to save my feelings. The irony of it all is that Ethan was in my belly then, albeit only for about a week and unbeknownst to anyone else including myself or my husband. I had remarked about how nauseous I felt and attributed it to driving thirty minutes out to Bedner's since I sometimes get motion sickness. I came home and wanted to throw up, blaming this on the pizza that my sister and I had stopped for on the way home. Nope, it was Ethan, hiding out in my belly all along! This year we got to skip the nausea and fatigue and throw in the excitement that came with having Ethan on the outside and being able to join the ranks of parents pleading for their child to "just smile! For one picture! Smile for a picture for grandma!" 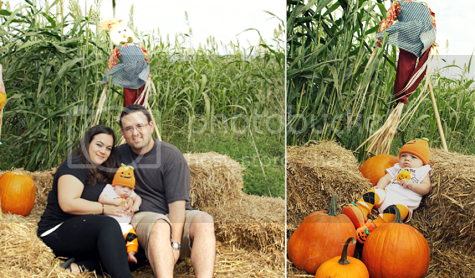 Dressed in his fall finest, we posed for pictures and walked amongst the pumpkins until the Florida sun decided to come through in full force. My husband helped Ethan select the perfect pumpkin -- well, second to Ethan himself, of course! -- and we were on our way. Love your blog and I am following back! Your little Ethan is so cute! Glad you want to be a part of the secret santa! I will notify you soon! Absolutely adorable! 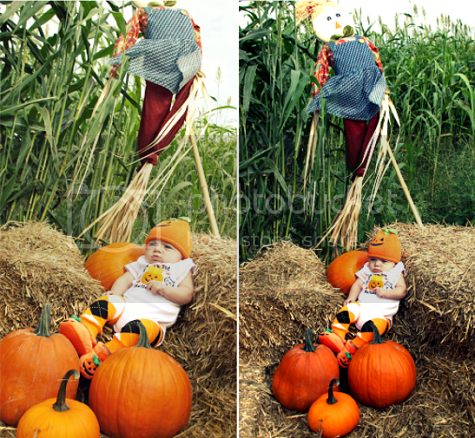 LOVE these pumpkin patch photos; they're just too cute! What a cute story and baby sure doesn't look like he minds all that excitement, huh? 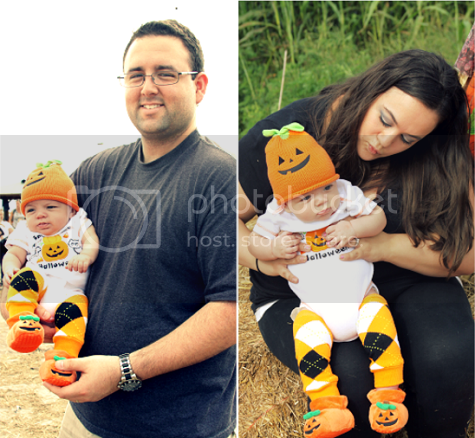 Love his lil pumpkin shoes LOL. Ah ha, these are the cutest pics ever! Hi, love your blog! Following you via GFC! 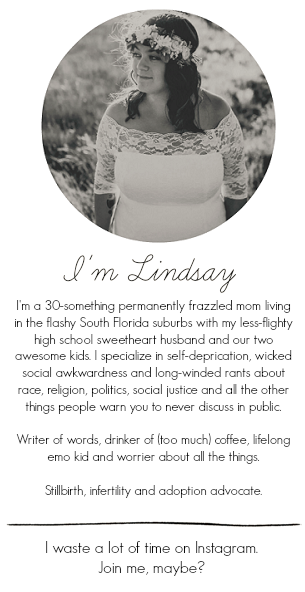 PS: You don't have to be a mom to be part of the Mom Blog Society. Come join us! Those argyle leg warmers are absolutely adorable. I'm following you back from the Say Hi Sunday Hop. This pictures are adorable! I love the little hat. I found you in the Say Hi Sunday blog hop. What a beautiful family and a very adorable baby! Nice photos! Hi! I'm following from the Sunday blog hop. You're blog is great. 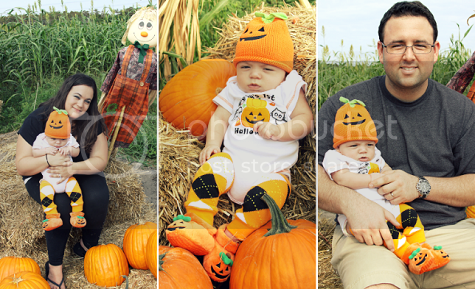 I love the pumpkin patch pictures, so cute! 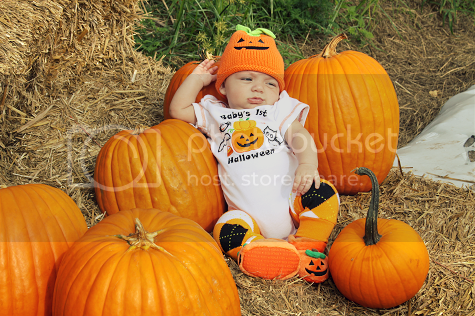 Aww, Ethan looks so cute and it looks like you guys have an awesome pumpkin patch. I LOVE Ethan's hat! Omg these pictures are too cute!